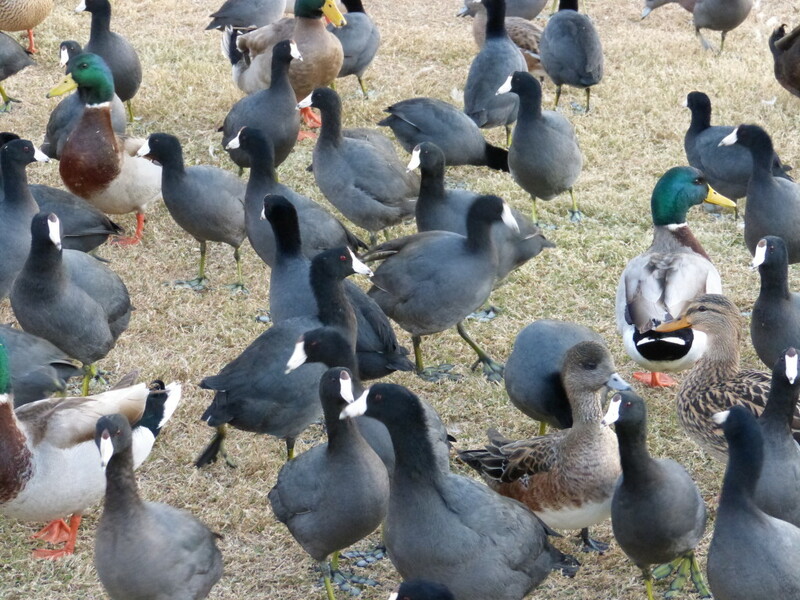 I’ve been on the hunt for duck eggs recently here in the Charlotte area. I’ve been surprised at how many people have asked about them lately, but for good reason. Many people that are sensitive to chicken eggs actually do just fine with duck eggs. Interesting, isn’t it? Maybe because most of us end up eating chicken eggs so much that our bodies just want a break? I have done some research and asked around and have come up with some resources that may be helpful in the duck egg hunt. I haven’t bought eggs from any of these places myself, but I’m hoping if any of you have, you’ll share your experiences so we can help other people that are on the hunt. Some of these are general resources for farms or farmers markets in the area. I am hoping as we move closer towards spring and more of the farmers markets start happening around town, we may find even more people who have duck eggs. The next time you are at your favorite farmers market, start asking the vendors there. If the farms know a lot of people are wanting them, maybe we can convince them it’s a product that they should bring to market. It can’t hurt to try! These resources are all over the Charlotte area and beyond, so check out which ones might be convenient to your area. If you find a good resource, let us know! It’s so important to support our local farmers and, in turn, we get a high quality product that will help us eat healthier! I like grapefruit, although I don’t typically get overly enthusiastic about it. When I first saw cocktail grapefruit, one of the nice Trader Joe’s workers explained that they are sweeter than other grapefruit and less acidic, so I decided I would try it. An obsession was born! They are, indeed, sweeter and less acidic but also way more interesting than that. And they aren’t even grapefruit! Their official name is a Mandelo, and they are a combination of a frua mandarin (tangerine) and a Siamese Sweet Pummelo. (Hence the name, Mandelo). It was never officially released to the public, so somewhat of a mystery as to how it is now available. Gotta love a fruit mystery! They are a bit smaller than what we’re used to seeing with standard grapefruit, they are super juicy, and they have lots of seeds. I was once told that the reason they are not more readily available is that the typical American consumer won’t buy fruit with seeds in it. Seriously? They are big seeds, so you just move them out of the way. Better yet, plant them and grow more fruit! They make a great juicing fruit, but just peeling and eating is pretty great too. This morning I combined some with pineapple, cara cara oranges, banana and homemade coconut milk yogurt for an amazing start to my breakfast. So good! High in Vitamin C and fiber, keep an eye out for them at your local store and give them a try. They are delicious, and because they are only available once a year, they are a a special treat! 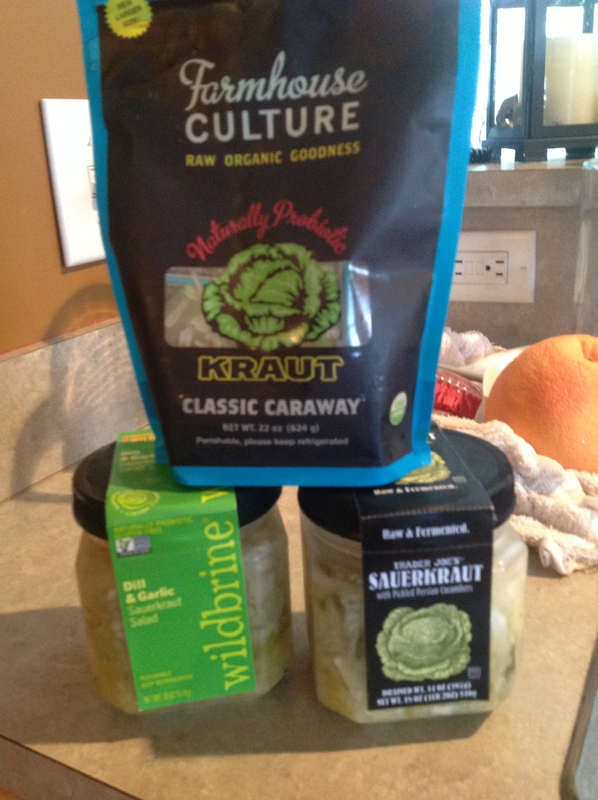 I never thought I would be saying this, but I love raw sauerkraut! In many cases, fermented veggies can really help heal gut issues (not always, so ask your health care provider first!) and yes, I sometimes make them at home But I tend to make everything at home, so I’m so excited when I can find something ready-made that is good for me and tasty at the same time. These are a couple of the brands that I’m able to find locally, so they are definitely at the top of my favorite products list! Have you noticed all the different types of citrus in the stores lately? This is prime time for all those beautiful oranges, grapefruits, tangerines and more. I, personally, have become quite the pest at my local Trader Joe’s, waiting a bit impatiently for the cocktail grapefruit to come in. They usually show up for a very short time in January or February, and only at Trader Joe’s. They are delicious, but they aren’t here yet! While we wait, you might try something a bit more exotic than your typical navel orange like these beautiful blood oranges. Aren’t they gorgeous? I cut into this one and didn’t want to eat it until I took pictures because the coloring was so amazing. Did you know that they are considered an anti-aging orange? 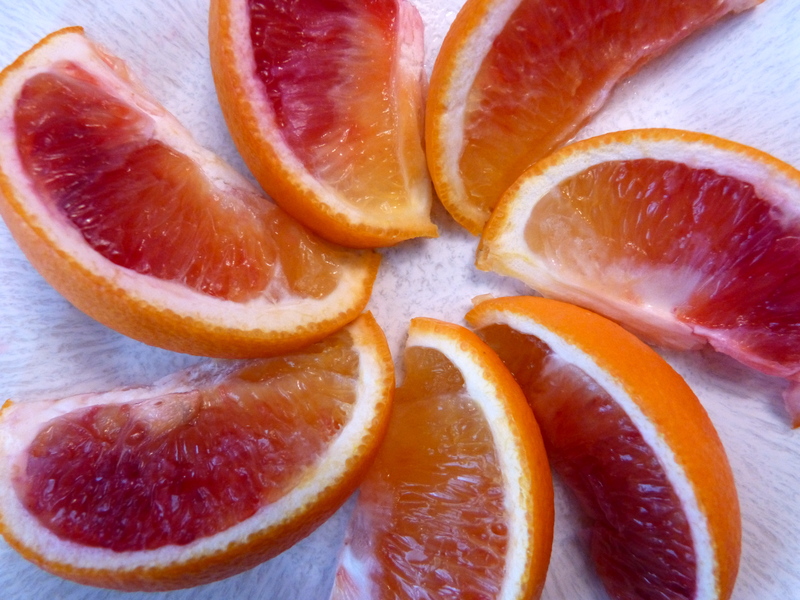 Maybe it’s because there is even more vitamin C in blood oranges than a regular orange? 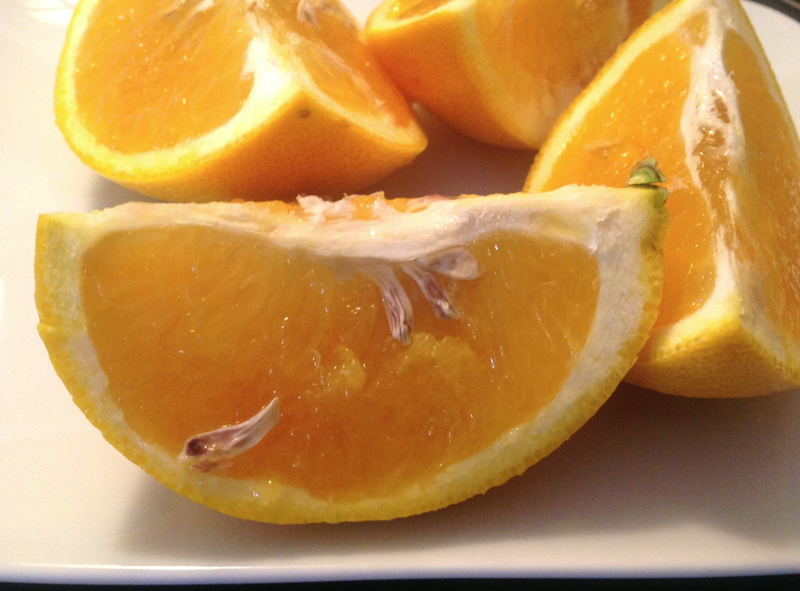 Then I sliced open a Cara Cara orange – have you tried one yet? You can see them with the blood oranges in the banner on the front page. They are bright orange outside and look like a regular navel orange, but they have beautiful rosy colored flesh inside that is seedless and so sweet! According to the Sunkist website, they are a cross between the Washington navel and the Brazilian Bahia navel, and were first discovered in 1976 at Hacienda Cara Cara in Venezuela. While reading about Cara Cara oranges, I found a really helpful resource from Sunkist – it is all the nutrition information for different types of citrus. 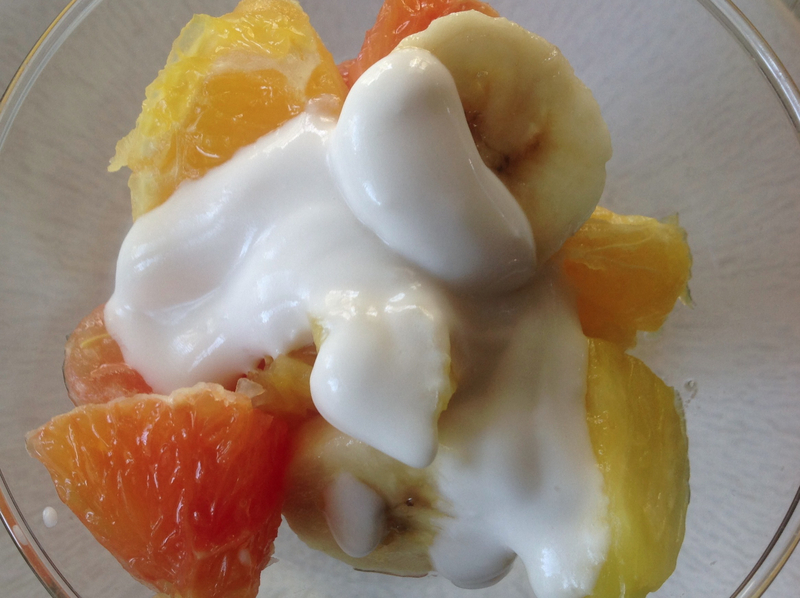 Check it out here when you want to feel good about adding some citrus into your meal plan! 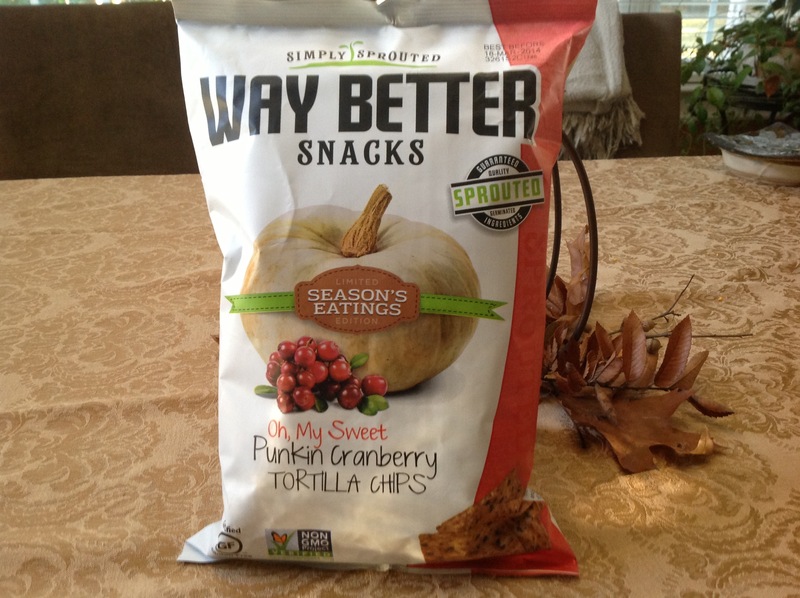 I have been a big fan of Way Better chips (unfortunately, since they can be a tad addicting! ), especially the Sweet Potato flavor, but this fall they have really made life difficult. It is so hard to resist their Season’s Eating, Limited Edition Oh, My Sweet Punkin Cranberry Tortilla Chips! Now, the good news is that they are made from some healthier ingredients. Here’s the list: Stone ground non-GMO corn, sunflower oil, cranberries, pumpkin, organic sprouted flax seed, organic sprouted quinoa, raspberry, pure sea salt. If you are chip lover and are looking for something that’s a bit healthier and really tasty, you definitely need to give these a try. Locally, you can find them at Earthfare and Fresh Market. Since they are a seasonal product, I don’t know how long they will be around so grab some soon. Just make sure you leave a bag or two for me! Posted in Food, Products we love | Comments Off on My Favorite Products! Finally, a dairy free cheese that tastes almost cheese-like! Ok, it’s been a few decades since I’ve tasted much cheese, but I really am enjoying this new product. I made nachos recently, and enjoyed every gooey morsel. It takes so little to entertain us food sensitive folks, doesn’t it?! The brand name is Daiya, and it comes in wedges and bags of shredded cheese, both in several flavors. Click here for their website and more information. Let me know what you think! 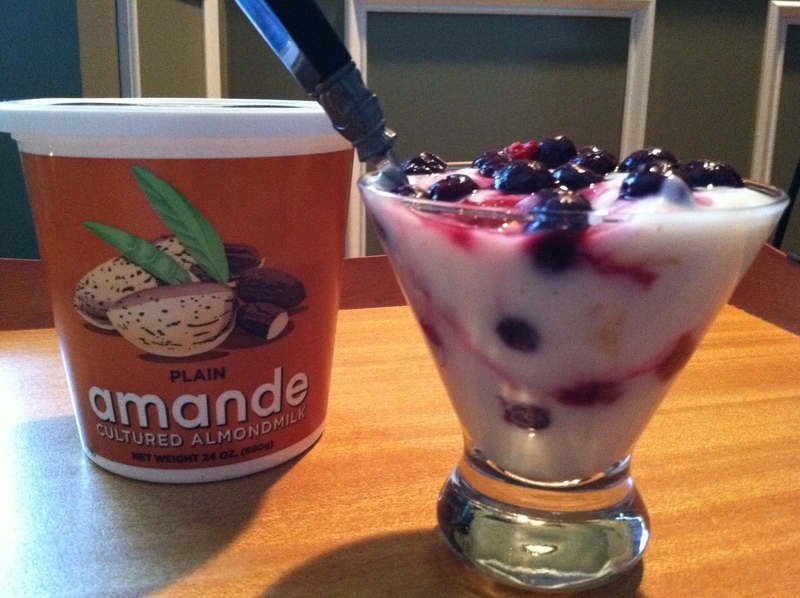 Amande Yogurt – My New Favorite Product! My new favorite product! 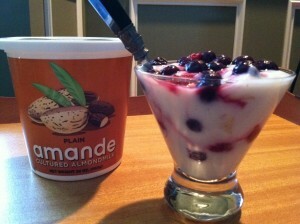 Yes, that was me doing the happy dance in the grocery store aisle when I first found Amande yogurt. It’s made from almond milk, fruit-juice sweetened, thickened with pectin (that’s a good thing), no GMO (a very good thing! ), and it wasn’t crazy expensive. I had my fingers crossed that I would like it since I can never buy anything that is already made, and to my delight – I love it! All the flavors are yummy but still a little high in the sugar grams for me, so I usually stick to the plain and add a bit of fruit, walnuts, etc. Another trick is to take one spoonful of one of the flavors and add it to my dish of plain. It adds a bit of extra flavor but not too many grams of sugar. It’s so good, and my body is very happy that I can eat yogurt now. I am still experimenting with making my own coconut milk yogurt as well, but it is a huge luxury for me to actually be able to go into a store, buy something, and eat it – yeah! Stay tuned – I’m working on using it for some frozen yogurt as well. Do You Have Childlike Taste? I found a great article discussing the way we, as Americans, are eating and the retail establishments that are supporting our childish ways. (Think cupcakes!) Really interesting reading – check it out here. Posted in Food, Food, News, Products we love | Comments Off on Do You Have Childlike Taste?